Welcome to a bumper May Passing of the Pioneers. So many interesting pioneers passed in the month of May, I had to leave some for next year. Those that remain had such great stories that it was necessary to share some extra bits and pieces found about them. Some just passed through the Western District from time to time, others lived there only for a short period while others were residents for over fifty years, but they all left their mark in some way. They include army captains, ship captains, a dentist and a naturalist. Captain Foster FYANS: Died 23 May 1870 at Newtown. Western Victorian historian, Margaret Kiddle, wrote in her book Men of Yesterday: a social history of the Western District of Victoria (1834-1890) “the story of Foster Fyans’ commissionership is a joy to historians” (p.50) . Born in Dublin, Ireland, Foster Fyans was an army captain. He enlisted in 1816 and served with different regiments of the British army including a stint in India. On arrival in Australia in 1833, he became the captain of the guard on Norfolk Island and remained there for two years. In 1837, he left the army and headed to Port Phillip to become the first police magistrate at Geelong. From 1840, Foster Fyans held the important position of Crown Lands Commissioner for the Portland Bay area. A squatter taking up land had to seek permission from the Commissioner and pay an annual fee. The Commissioner’s word was law and there was no arguing with Foster Fyans, a man with a temper. He tangled with many squatters including the Hentys. Governor La Trobe had his moments with Fyans and Kiddle cites La Trobe declaring Fyans “secured to him the chance of a duel once at least in the week as long as he may live” (p.50). “They were usually laid off in ten mile blocks, measured with a compass in his hand, and timing his horse. A blackfellow followed, and notched a tree line. When the Commissioner had travelled what he considered the distance, he notched a corner tree with a broad arrow, and then rode off again at right angles to the next corner, and so on round the block. Captain Fyans was a bluff old gentleman…” (p.26). Despite his ways, Fyans was kept on as Commissioner because there was no one else qualified to do the job. 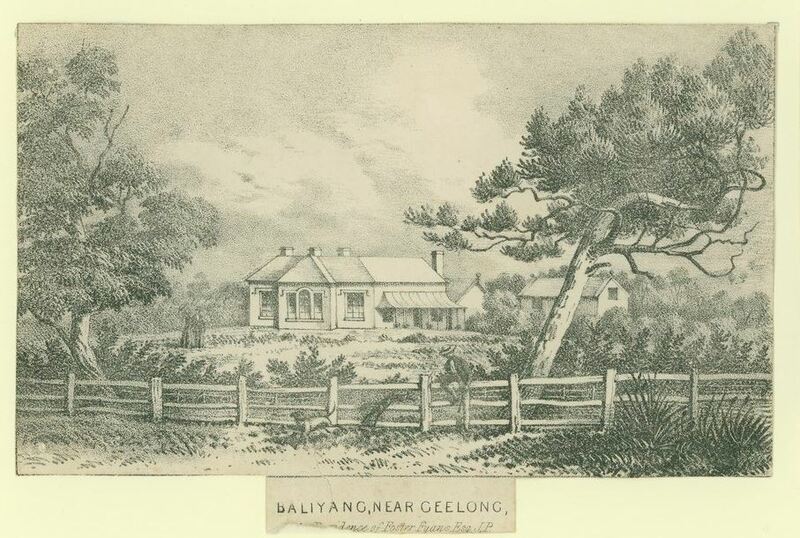 Foster Fyans died at Balyang (below) in the Geelong suburb of Newtown and while the house was demolished in 1896, the site is now a part of the Balyang sanctuary. Around the Geelong area the Fyans name is still present with Fyans Street and the suburb, Fyansford. Around the Grampians there is Lake Fyans and Fyans Creek. William CARMICHAEL: Died May 1890 at Macarthur. William lived at Harton Hills, near Macarthur. According to his obituary, William purchased the property in 1843 from squatter James Hunter. However, the Macarthur Historical Society website states William bought the property from the Bolden brothers in 1842. Any wonder William’s obituary notes there were “many and varied stories” about how he acquired Harton Hills. Captain Alexander CAMPBELL: Died May 25, 1890 at South Yarra. Alexander Campbell was born in 1803 in Argyleshire, Scotland and followed his brothers to Tasmania in 1825. After farming for a few years, Alexander left for Sydney in 1831. The following year a position in charge of the whaling station at Portland was offered to him but he didn’t take up the role until 1836. In the meantime he went whaling, sailing as far as Japan. After Portland, he went on to Port Fairy where he stayed for about fifteen years. In that time he built at least two cottages, one occupied by his sisters. In 1851, he became a harbour master and later moved to Gippsland where he returned to farming. In his last years, Alexander and his wife moved to Caroline Street, South Yarra where he died aged 87. Captain David FERMANER: Died May 1893 at Newport. Earlier this year I wrote a Trove Tuesday post entitled Gilding the Lily. Captain David Fermaner may have been guilty of just that. At the time of his death, Fermaner, a whaler, was credited as being Victoria’s earliest colonist and that he was standing on the beach at Lady Bay when the ship carrying the first Henty’s reached the Victorian coastline. However, after reading Jenny Williams Fawcett’s account of David Fermaner and his link to the legend of the Mahogany Ship, it became obvious telling the truth was not one of his strong points. After his time in the south-west, Fermaner later became pilot and harbourmaster at Port Albert in Gippsland. William Thomas PILE: Died 25 May 1901 at Portland. William Pile was born in Devonshire, England and as a boy served an apprenticeship in the fishing industry at Hull. 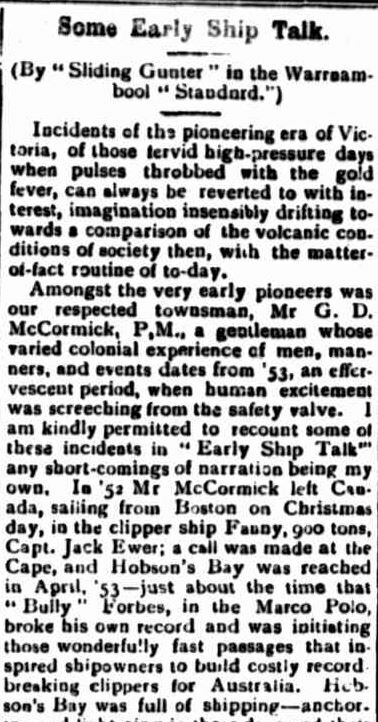 With an urge to see the world, he became a sailor and in 1852, his ship Cossepore arrived at Portland, but he travelled on to Geelong and like many other ships’ crew he left and headed to the diggings. The thrill of the high seas and travel was a greater lure and he returned to England. It was not until 1854 on a return visit to Portland, he decided to settle. William’s working life in Portland started as a fisherman and in 1869 after a trip home to England, he returned with a new type of gun to harpoon whales. He bought into a wattle bark business with Stephen Jarrett that proved lucrative. In 1876 William became a Portland Councillor and then Portland Mayor in 1880 and 1886. 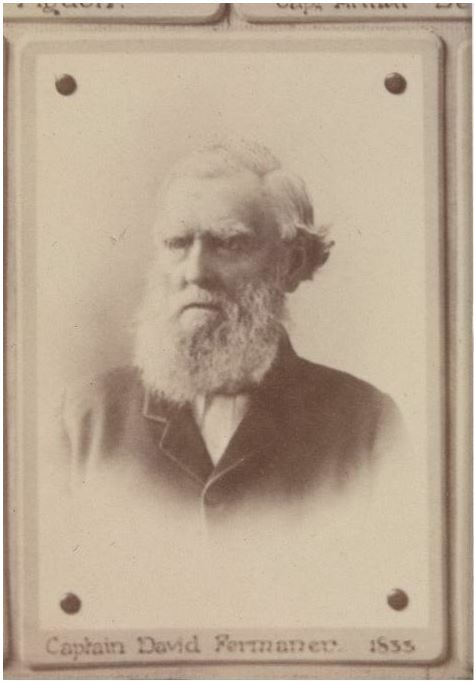 Stephen DUDDEN: Died 2 May 1903 at Hamilton. 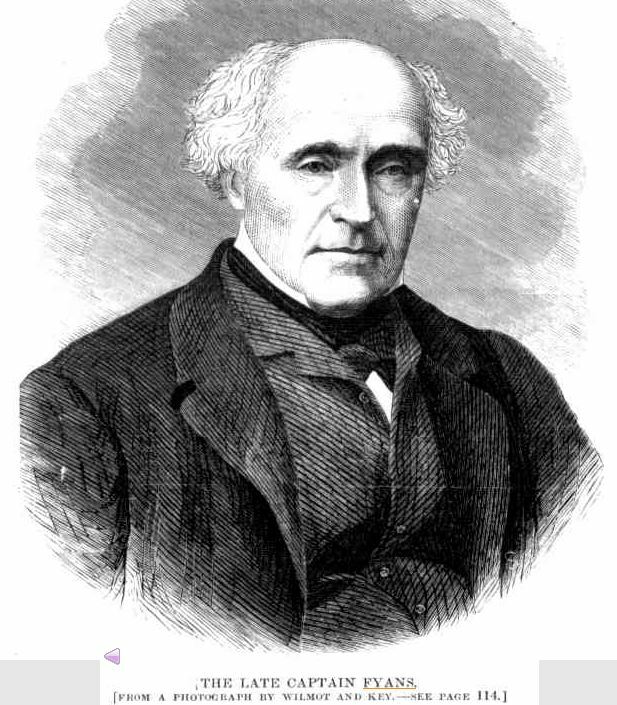 Stephen Dudden was born in Somersetshire around 1819 and arrived in Victoria in the 1860s. Stephen showed some entrepreneurial skills setting up a refreshment tent opposite the Hamilton Lands office, in Brown Street, during the rush to buy land after the passing of the Land Act in 1860. He later went to Portland working as a stonemason and then retired to Myamyn. In the month prior to his death, a dehydrated and disheveled Stephen was found by a Hamilton policeman and taken to the Hamilton Hospital where he remained until he passed away from senile decay. Janet MILLAR: Died 3 May 1910 at Portland. Janet’s obituary named her only as Mrs Browning, so I turned to the Australian Death Index to find her birth name, Janet Millar. Janet and her husband John Browning arrived in Victoria in 1849 and headed to Portland to set up a school. With the discovery of gold, the school was abandoned and the Brownings headed for the diggings. They returned to Portland and eventually John set up another school, John Browning’s Boarding School for Boys. Janet was eighty-eight at the time of her death and had kept relatively good health and was still tending her home. However, it was a once in a lifetime chance to see Halley’s Comet in 1910 that led to her demise. She had been out early on cold mornings trying to catch a glimpse of the comet and developed a chill, too much for her weak heart. Laurence FINN: Died 24 May 1914 at Port Fairy. Laurence Finn from Tipperary, Ireland arrived in Melbourne with his parents in 1841 and in 1843 they settled in Port Fairy. In 1858, Laurence married Ellen Crowe and they took up residence at Comely Banks, Port Fairy. Laurence’s father ran the Belfast Inn for a time until he let the lease lapse. As a the only child from his father’s second marriage, Laurence and his children inherited a large amount of land. 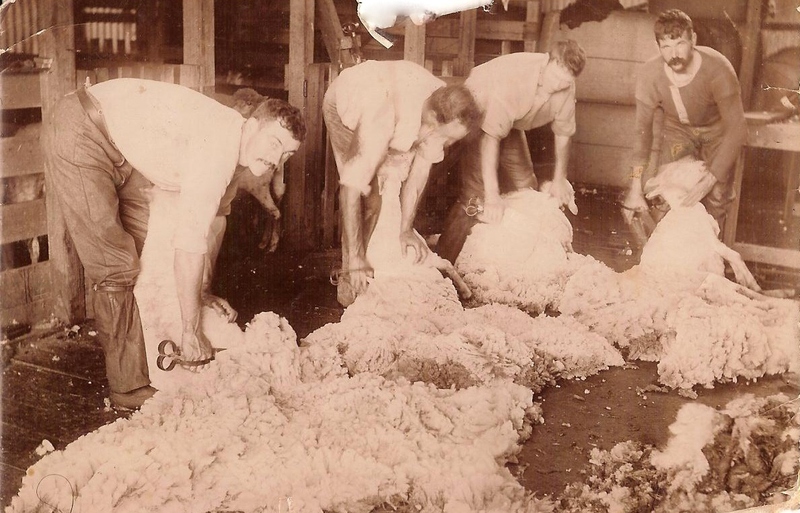 Laurence was a Justice of the Peace and was a member of the Port Fairy Agriculture Society. John McCOMBE: Died 7 May 1916 at Casterton. Fourteen-year-old, John McCombe arrived in Melbourne aboard the Champion of the Seas in 1854. 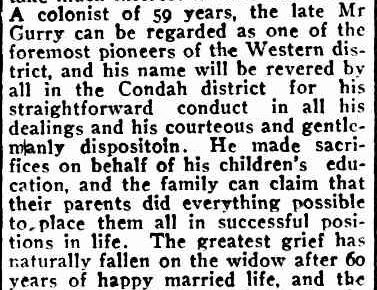 His family headed directly to Portland but John soon moved on to the Casterton district taking up work at Dunrobin and Nangeela. He purchased a bullock team and began a carrying business and moved to Sandford around 1861 after he married. Four years later he bought land at Deep Creek, Corndale and he remained there until his death. Frederick Sunderland Wood MAWSON: Died 19 May 1916 at Geelong. 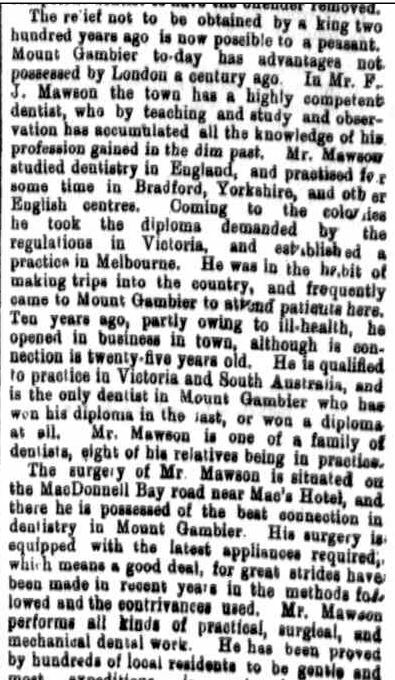 Frederick Mawson was a dentist and he travelled the Western District and Mt. Gambier inspecting the teeth of the residents. Born around 1843, Frederick studied dentistry in England and practiced in Yorkshire. After acquiring the necessary qualifications for Australia, Frederick set up practice in Geelong and for a few years had a practice in Mt Gambier. 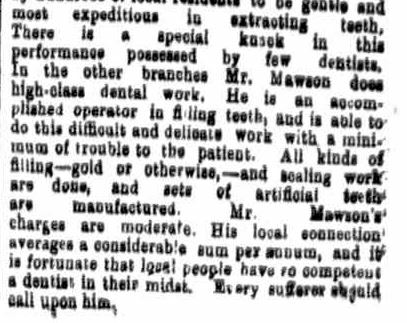 This “advertorial” from the Border Watch gives a good description of Frederick Mawson and his dentistry. 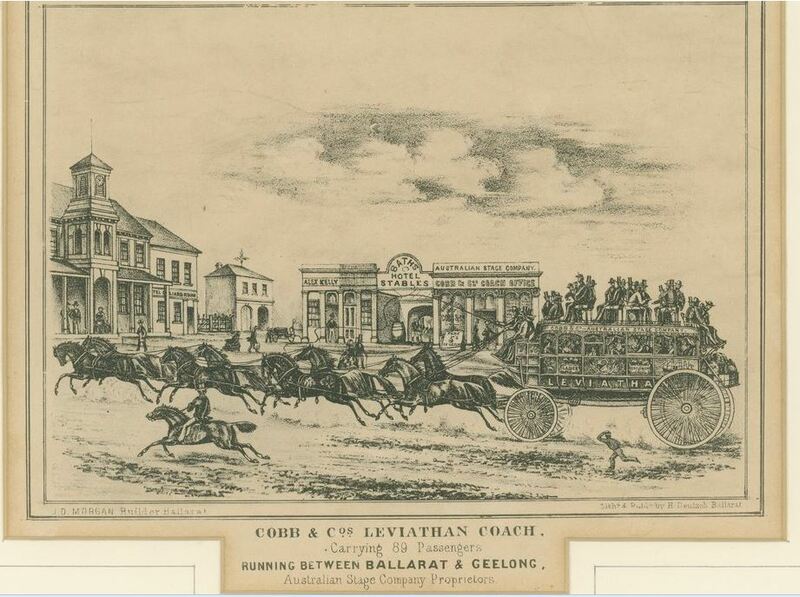 This is a perfect opportunity to show a Cobb & Co. coach and the Leviathan coach, introduced in 1862, was the height of madness. 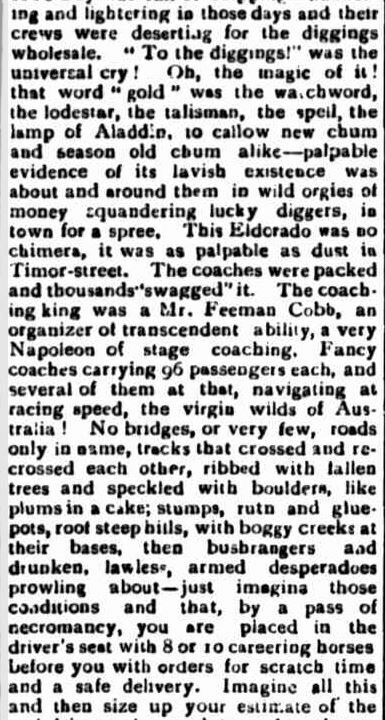 Smaller coaches would have been scary enough to ride in as they hurtled along unmade roads. But a coach for 89 passengers. What were they thinking? George’s account above mentions the perils facing the Leviathan coach, but it was not the risk that proved them unsuccessful. 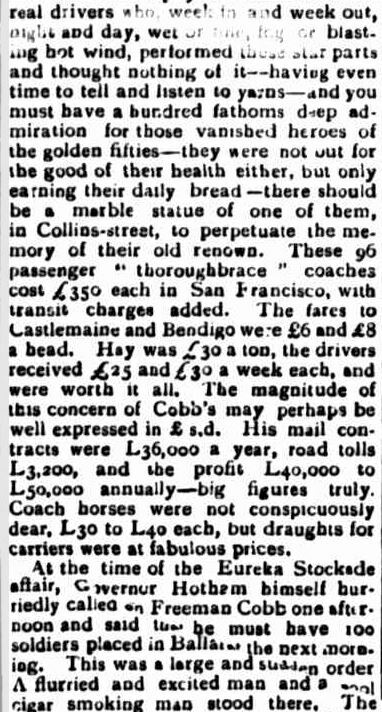 Rather, the driver’s whip could not reach the front horses, so a bag of stones were carried to throw at the leaders. George became a police magistrate in 1882 and purchased Bournfield Park Estate at Woodstock near Whittlesea and in 1889 he arrived in Warrnambool. He remained there until his death. He left a wife, Barbara Waddell and five sons and four daughters. John James VILLIERS: Died May 1917 at Warrnambool. London born John Villiers was a talented man. He arrived in Victoria in 1858 aged around seventeen and headed to the diggings. 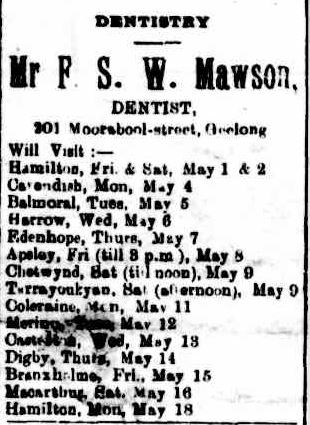 In the early 1860s he went to Warrnambool and his obituary in the Argus May 12, 1917 said he ran a painting and decorating business in Libeig Street and imported crockery. John’s interest in painting went beyond house painting. He enjoyed painting landscapes in oils and watercolours and once he presented a painting to the Warrnambool Art Gallery. A man of the arts, John was also an amateur dramatic and vocal performer and organised dramatic events to raise money for the likes of the Warrnambool Hospital and the Mechanics Institute. John was a part of the earliest known sound recording in Australia by Warrnambool shoe shop owner, Thomas Rome on one of the first Edison phonographs. John Villiers sang The Hen Convention and if you click on the link, you can hear the song. More information about Thomas Rome and John Villiers and their recordings can be found in a story by ABC Southwest from 2010. Sarah BARKER: Died May 1917 at Ararat. Most months I can find a pioneer that I have even just a tenuous family link to. This month it is Sarah Barker. Sarah was the mother of Stephen Ward. Stephen married Isabella Harman, daughter of James Harman. I didn’t know that Sarah Jerrett, as she was in her obituary, was formally Sarah Ward and Sarah Baker. When I read the obituary however, it mentioned the Ward connection and her son Stephen. Sarah, from Norfolk, England and her first husband James Ward, arrived at Portland in 1852. She was twenty-three. Sarah remained there until the late 1890s when she moved to Ararat. Prior to that Sarah and James had seven children. including second youngest Stephen in 1867. James died in 1879 and Sarah married Francis Jerrett in 1883. John GURRY: Died 24 May 1917 at Condah. John Gurry and his wife left Ireland for Portland in 1857. They tried Harrow and Branxholme, running the Western Hotel there, then settled in Condah where John ran a farm. In their later years, they moved into the Condah township. John was buried in a family grave at Portland. Adam EDGAR: Died 8 May 1941 at Tapanui, New Zealand. At the age of six, Adam arrived in Portland aboard the Severn in 1857 with his parents, James and Isabella and his eight siblings. The family went straight to Pine Hills Harrow the property of James Edgar’s brother, David. Like his cousins and siblings, he was educated at the private school David Edgar had established at Pine Hills. In 1871, Adam married Margaret Huston and in 1875, they left for New Zealand where they stayed for the rest of their lives. One of Adam and Margaret’s sons was the Reverend James. 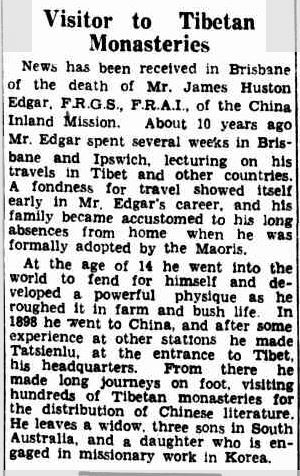 Huston Edgar, an explorer, missionary and author who spent much of his life in China. His obituary is below. Adam’s sister Jean Edgar was a Passing Pioneer from March 2012. Captain Robert Ernest BAKER: Died 4 May 1943 at Larpent. What an interesting character Captain Baker was. Not a ship’s captain, but a captain in the AIF during WW1 he served with the 8th Light Horse. Reading his eighty-eight page service record, I found that Baker was actually a Lieutenant when delisted and was a just temporary Captain at one time during his service. “Captain” does have a better ring to it. This wonderful photo from the Australian War Memorial has a real Western District flavour but sadly only one, Robert Baker, returned. Captain Baker is seated on the left. He was forty-one at the time of enlistment. The other men are seated right: Keith Allan Borthwick of Armadale. 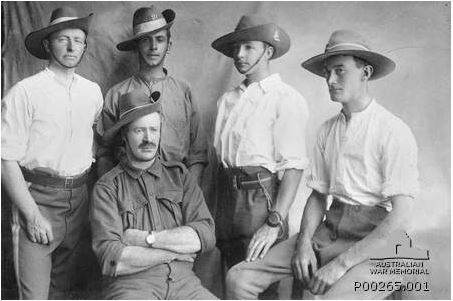 Standing from left: Major Thomas Harold Redford of Warrnambool, Lt Edward Ellis Henty of Hamilton, Lt Eliot Gratton Wilson of Warrnambool. Edward Ellis Henty was the grandson of Stephen George Henty. He, Borthwick, Redford and Wilson joined up on the same day, 21 September 1914 and all died on the same day, 7 August 1915 at the battle of The Nek at Gallipoli. Robert Baker’s war was plagued with illness, including dysentery and lumbago, but it probably saved his life. On 7 August 1915, he was in the No 1 Australian Stationary Hospital on Mudros. 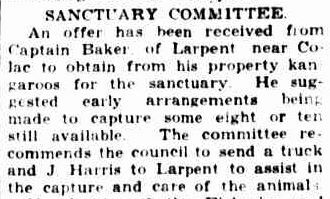 After the war, Captain Baker transformed his property at Larpent into a sanctuary for the native fauna. He often contributed to the Nature Notes in the Argus. In 1936, he offered kangaroos from his own sanctuary to the Healesville sanctuary. Healesville Sanctuary was in its first years as it was officially opened in 1934. Herbert Edward RIPPON: Died 19 May 1954 at Hamilton. Herbert Rippon was the son of George Rippon, part owner of the Hamilton Spectator Herbert lived at Edradour, a house on Ballarat Road, Hamilton I must have passed a thousand times. Photos of Edradour can be seen on a Hamilton real estate agency listing. Herbert inherited ownership of the Hamilton Spectator in 1899. The Victorian Heritage Database has a short bio on Herbert and he was one of the original backers of Sir Reginald Ansett, then a Hamilton resident. He also was a director of John Thompson & Co department store of Hamilton.